On Easter Day 1 April this year, I was up early and walked to the Vatican. With persistence and luck, I managed to get my backpack through two security stations allowing me to enter St Peter’s Square and find a good standing position for the open air Papal Mass that morning. It was a grand three hour event, combined choral mass and state pageant, in front of 80,000 people from many countries around the world. In the early afternoon, I strolled out of the Vatican, through the holiday crowds, along the Tiber River to the north east and began my long contemplated pilgrimage to Jerusalem. 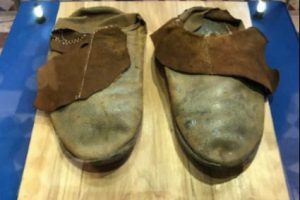 In 2015, I had walked the Camino de Santiago from St Jean-Pied-De-Port and in 2016 the Via Francigena from London/Canterbury to Rome but I had been in two minds about the longer, lonelier and more complicated route from Rome to Jerusalem. Historically, medieval pilgrims going to Jerusalem walked out of their homes, picked up the nearest pilgrim path and headed for a port on the Mediterranean Sea where they boarded a boat to Palestine. The modern Via Jerusalem from Rome heads south-east to the port of Bari where pilgrims catch a ferry across the Adriatic Sea to Albania or Greece and then make their way overland for a way and later catch a second ferry to a Middle Eastern port. This pilgrim very much likes walking in central and northern Italy and so I decided to head north from Rome through Assisi, Gubbio and Ravenna to Venice, catch a boat across the northern Adriatic to Split, walk the Dalmatian Coast through Croatia and Montenegro, then go inland across Albania, Macedonia, northern Greece and Turkey on the Via Egnatia to Istanbul. 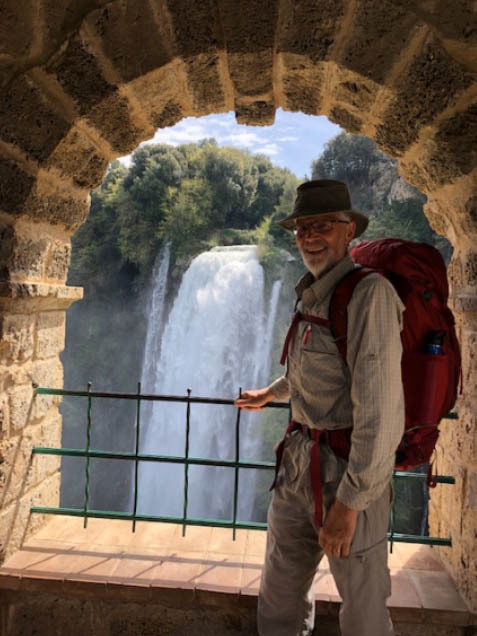 I then planned to boat or fly to Israel, bypassing Syria and Lebanon, and hike the final leg from the northern port of Haifa to Jerusalem on the Israel National Trial. Leaving Rome, I followed the Via di San Francesco (Way of St Francis) that St Francis and his companions were thought to have taken in their journey in 1209 from Assisi to Rome to meet Pope Innocent III. The Pope wanted to ascertain whether St Francis, who had become a local sensation, was a genuine believer or a crackpot. Pope Innocent decided that Francis was a model Christian and an excellent leader so he supported his teachings and founding of the Franciscan order. Walking south to north, I had great difficulty following my electronic guide book with its north to south route descriptions. I often strayed off the pilgrim path causing me to backtrack and walk an extra 3-5km on some days. There were some Way signs but they were intermittent until closer to Assisi. I did not use a GPS, preferring to rely on Google Maps on my iPhone to locate myself and guide me to my destination each day. I had a UK SIM card in my phone allowing cheap communications between all EU countries and Australia. The local farmers were frequently calling me over and telling me that I was walking in the wrong direction. Didn’t I know that all roads lead to Rome, not away from Rome! Being early in the walking season, I did not meet any other pilgrims until the night of Day 6 at a hostel (the first I found open) with a good restaurant in Poggio Bustone, a town unusually built on the side of a steep hill overlooking the Tiber Valley rather than on top of the hill. I had dinner and interesting conversation with three German pilgrims, one on his fifth pilgrimage to Rome, and a young Italian man in his late twenties on his first pilgrimage. On subsequent days, I met up with many other pilgrims out on the trail and sometimes in the evenings for a shared meal. 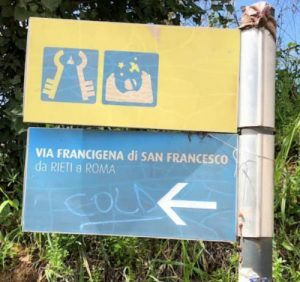 Fortunately for me, most of these pilgrims were from northern European countries and spoke very good English, but of course all of them were walking to Rome. I came across only two pilgrims, older Italian guys who spoke very little English (like my Italian! ), who were also walking north to Assisi. Over my two days between Assisi and Gubbio, I met five other Australian pilgrims heading to Rome, first two women in their thirties coming from Arezzo, second Tim from Young walking with his Italian friend whom he met on a previous Camino to Santiago and third Janet and Richard who had come in from Florence on the Via di San Francesco. 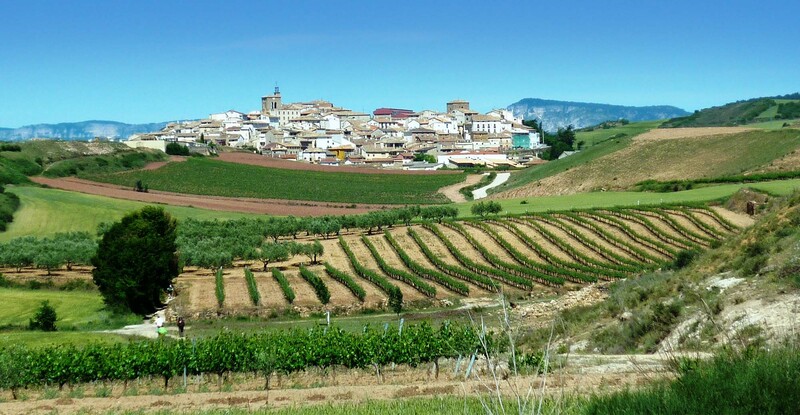 Janet was the experienced walker, Richard was on his first Camino and feeling the pinch a little. He downed two bottles of beer in quick succession on arrival at our lodgings in Biscina, where later we shared a fabulous home cooked meal served by the owners. 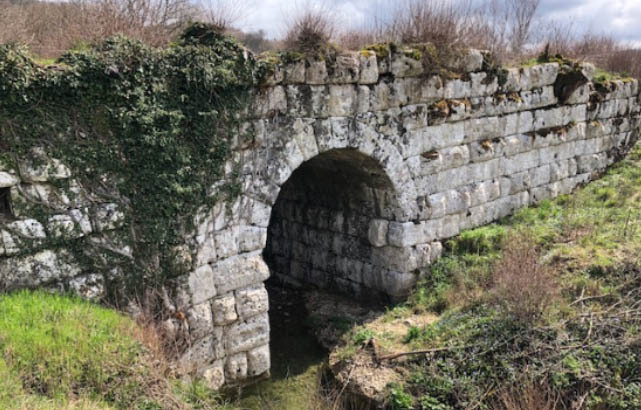 The walking trails were a combination of minor asphalt roads connecting towns and gravel or dirt tracks passing through conversation parks, all in reasonable condition, although a little muddy in parts because of the cold and wet spring in Europe this year. 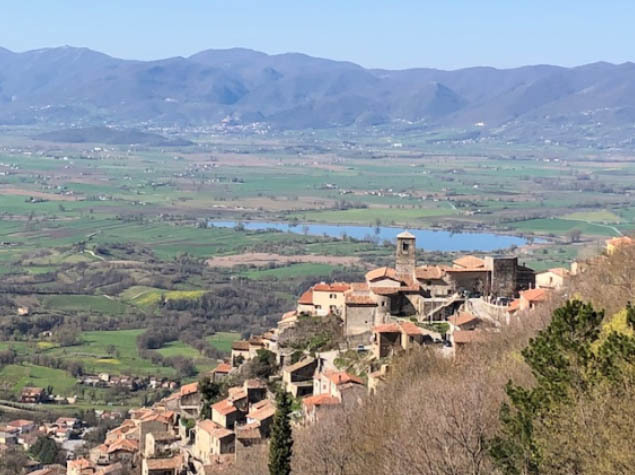 The trail went into the Central Apennine Mountains that run down the centre of Italy, often giving spectacular views of the valley floor below. Fortunately for me, the trail went only into the foothills and not up to the peaks. Nevertheless, the total ascent was 500–1,000m most days with similar descents. My backpack weighing about 11kgs slowed me down until I got pack-fit after about 10-12 days. I found a good bed in a hotel, guesthouse or B&B each night usually only on arrival at my destination. It was too early in the season for the pilgrim hostels to be open and I only managed to stay in two hostels during my 26 days in Italy. On my way to Assisi, I particularly enjoyed visiting and staying in the old towns of Rieti (with its partially excavated amazing underground Roman and medieval world sitting below the modern town streets) and Spoleto (with its fine Duomo, Roman theatre and many medieval buildings and houses). I also enjoyed seeing the Cascada del Marmore, an impressive 165m waterfall near Piediluco, created by the Romans in 271 BC to divert some of the water of the Velino River over natural cliffs at Marmore, thereby reducing flooding at Rieti. 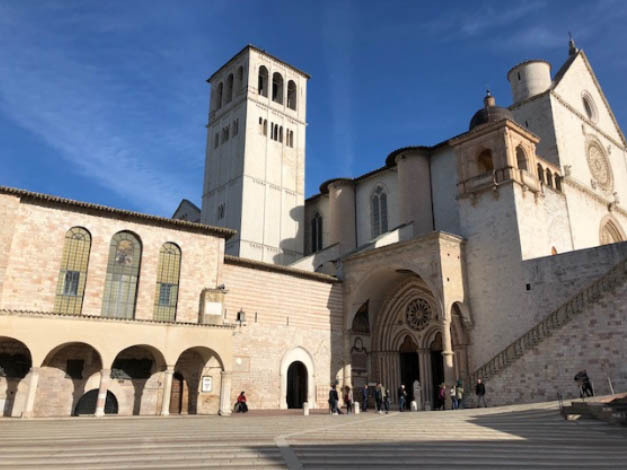 In Assisi I had my first rest day (Day 14) and visited the Basilicas of San Francesco and Santa Chiara (St Francis and St Clare) and the Cathedral of San Rufino where Francis and Clare were baptised. On opening my hotel window the next morning, I could hardly believe my eyes for below me was a man dressed only in two hessian bags crawling painfully slowly up a steep road on his bare hands and knees. Some of my friends had called my pilgrimage crazy and wacky, but whatever this hermit’s mission was, I think I can safely say it was wackier than mine! 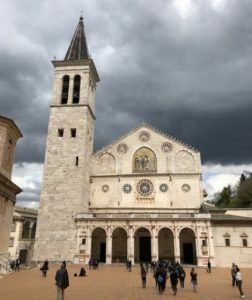 After Gubbio, I left the established pilgrim trails heading north to Austria and Germany and found my own way north east through undulating countryside and old hill top towns, like the wonderful University town of Urbino, to Rimini on the Adriatic Sea. Then I headed north through Cervia, Classe and Ravenna, all ancient ports where medieval pilgrims headed to reach ships sailing to the Holy Land and Jerusalem. I visited the ancient Christian Basilicas in Classe and Ravenna built in 6th century AD by the Byzantine Emperors from Constantinople (the former Eastern Roman Empire) following the sacking of Rome and the collapse of the Western Roman Empire. After Ravenna, I had three 30-40km walking days on flat coastal plains, crossing the mighty River Po on a 1.1km long bridge on the last day, before I arrived in the old port town of Chioggia at the southern end of the Venetian Basin, with its canal and churches, like a miniature Venice. I caught a boat from Chioggia into Venice arriving around 7pm at the Doge’s Palace near St Mark’s Square and Basilica. It was 25 April, St Mark’s Feast Day, and our Anzac Day. The next day (Day 26) was my second rest day and I had a great time exploring parts of Venice again on a glorious sunny day. 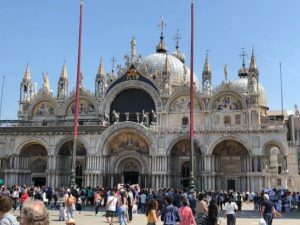 I visited St Mark’s Basilica and was impressed by its exquisite Byzantine architecture from the 11thC and the enormous number of mosaics inside telling very detailed biblical stories from the Old and New Testaments, as well as more contemporary stories such as the robbing of St Mark’s relics (part of his mummified body and bones) by two Venetian merchants and two Greek monks from a church in Alexandria and bringing them back to Venice to be installed in the new St Mark’s Basilica! I also marvelled at the four beautiful bronze San Marco horses from antiquity, now installed inside the basilica with replicas outside above the main entrance. Recent carbon dating has shown the horses were made around 200 BC and it is likely they were first installed on top of a public building in Rome for some 5 centuries. Then they appeared in Constantinople in the Hippodrome for 7-8 centuries and later were taken to Venice in 1204 AD by Venetian soldiers after the sacking of Constantinople by the Fourth Crusade. Napoleon took the horses as a trophy of war back to Paris in 1797 AD but was forced to return them to Venice after his defeat at Waterloo in 1815 AD. The next day (Day 27) I was up well before dawn to catch a ferry boat to Venice airport to fly to Split in Croatia. My plan to follow in the footsteps of medieval pilgrims and catch a boat across the Adriatic Sea had come unstuck as the Venice=Split ferries had been discontinued. NOTE: See the next CC for the continuation of John’s very long walk. St Francis’ shoes in the Basilica, looking in excellent shape. He obviously did not do much walking on asphalt roads like modern pilgrims!